Now is a good time to be in the gold business, according to Skip Wilson, CEO of Olympia Gold, Inc. Olympia Gold specializes in wholesale jewelry and costume jewelry, as well as chains-by-the-inch in layered gold and layered silver. The company also offers the Katie Ko line of fashion jewelry. Chains-by-the-inch have been a highly successful product line for the past several years, even as the price of precious metals has continued to rise. The appeal to these chains is their immediacy and customization. Sold on countertop spools, customers can actually touch the various chains, pick the weight and look they like best, then have a chain cut to their preferred length in a matter of minutes. “Assembly of this product is very easy,” Wilson says. 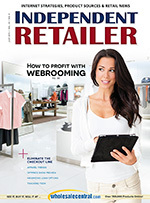 “We offer our retailers links to videos and instructions. It is so simple to assemble that a child could do it.” Chains-by-the-inch are great products for high-traffic retailers, including resort shops, jewelry stores, gift shops, and even flea market stalls. The key is to have someone available who can help customers select their chain and then assemble the final product. Retailers like this product, Wilson says, because it is extremely profitable. 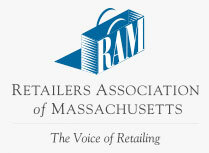 Many retailers enjoy a 400 percent mark-up on the chains. Aside from chains-by-the-inch, Olympia Gold also offers a wide selection of counter-top displays and different jewelry. This includes Swarovsky crystal necklaces and earrings, charms, bangles, bracelets and PermaCrystal chains that are also sold by the inch. Olympia Gold has been in business for more than 25 years. The company’s product line focuses on six main types of jewelry, including layered gold and silver chain, Katie Ko fashion jewelry, crystal and rhinestone jewelry, base metal chains sold by the inch, and colorful anodized aluminum chains sold by the inch. All the company’s products have an unconditional lifetime guarantee. 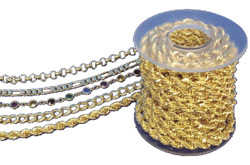 The layered gold and silver chains are sold on 300 and 150-inch spools. Call the company for wholesale pricing and shipping information.